A special angel horoscope that gives you a celestial "heads up" as to coming events and challenges. It's like your personal "little book of life" , your peek into the future, or a road map. With each order, I meditate and ask your Guardian Angel and others to guide me to choose just the right cards of what they want you to know for that month. The angels tell you exactly what you need to focus on each month. Wouldn't it be amazing to have access to this insight about yourself and your life? You no longer need to wonder what the angels feel is the most important messages. You will receive a PDF of cards and short description to paste to your calendar or day planner, for monthly reminders. Includes phone session to discuss cards. 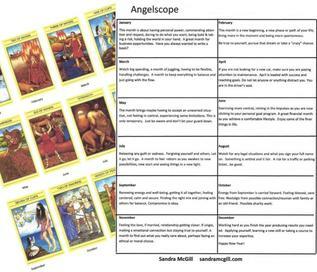 Even though you can order an Angelscope at any time, the 12 months is especially helpful at the beginning of each New Year. Please understand that this type of reading is not about questions but future predictions. ​ I use the beautiful Mythic Tarot Deck. Any information received in a reading, does not/should not replace seeking the counsel of a licensed mental health or legal professional, physician or other professional. Sandra is not a mental health counselor, legal adviser or physician. Sandra does not diagnose disease or give counseling for mental or physical health. By purchasing an Angelscope, you agree to this disclaimer and to release Sandra of any and all liability/responsibility. Entertainment only.